The changing technology in electric fencing has probably been the single most important factor responsible for the current high level of producer interest in management-intensive grazing (MIG). 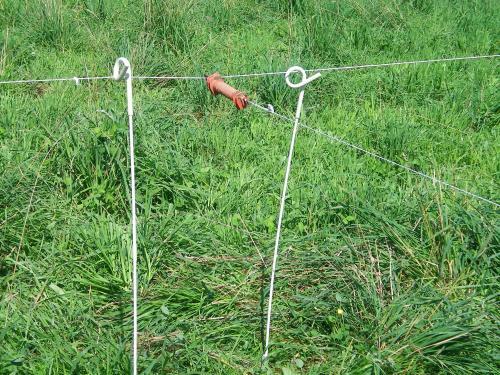 The introduction of what has been popularly termed "New Zealand-type fencing" has radically altered the affordability of subdividing pastures for purposes of MIG. Modern fence energizers are much more powerful and reliable in the face of adverse conditions. The major difference in the two types of energizers is the duration of electrical pulse and the force with which energy is entered into the wire. A conventional energizer loads energy (current) into the wire relatively slowly (.3 seconds) with limited force (voltage). A modern low-impedance energizer will load energy into the wire with much more force in a very short time (.003 seconds or less). The difference is that the long-duration, low-voltage pulse of energy is easily bled off the line through vegetation, faulty insulators and other leaks, whereas the short-duration, high-voltage energy pulse suffers only minimal losses to such leaks. An electrified perimeter fence is the most effective means of carrying energy for subdivision fences around the farm. The most cost-effective perimeter fence will be constructed using multiple strands of 12-½ gauge hi-tensile wire. The advantages of hi-tensile wire over most conventional barbed wire and woven wire include: Class 3, rather than Class 1,galvanization; greater wire strength, and ability to keep fences tight due to this strength; and the absence of barbs for ease of working and reduced likelihood of damaging hides and fleece. The difference in galvanization translates to about 250% increase in the life expectancy of the fence. 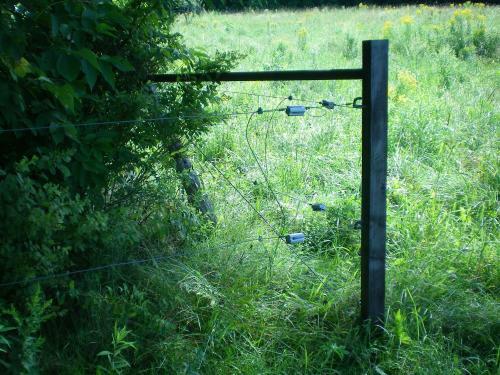 For cattle, a 5-wire fence with either all wires or only 3 wires energized makes a very reliable perimeter fence. Including non-energized ground system wires alternating with the energized wires is most advantageous on dry soils where the livestock may not be sufficiently grounded just through earth contact. For sheep or goats where predator protection is a major concern, fences are usually 7 or 8 wires with alternating energized and ground system wires. Permanent subdivision fences should also be constructed from 12-1/2 gauge hi-tensile wire. For most cattle situations, a single strand is usually adequate. If it is critical to keep calves in the same paddocks as their dams, then 2 or 3 wires may be used. The basic rule of thumb for height of wire on a single strand fence is two-thirds the shoulder height of the grazing animal. For sheep, a 3-strand fence is very effective. Sheep that are trained to electric fence can be kept in with 1- or 2-strand fence. Typically, in a mixed cattle and sheep situation, 3-strand fences with 10", 20", and 30" wire heights work well. There are several temporary fence options available. Unless a producer has specialized equipment for taking hi-tensile wire down and rolling it up, hi-tensile is not a good choice for temporary fencing. Portable fencing may come in the form of polywire or electroplastic twine, hot tape, electric netting, and multi-strand steel cable. Polywire, hot tape, and netting all consist of polyethylene or fiberglass strands interwoven with fine stainless steel or aluminum wires. Polywire looks like plastic baling twine in size. Hot tape is a flat, tape-like material that may be from 1/2–2" wide. Usually 6–9 wire filaments are included in the strand. Electric netting is more commonly used for sheep and goats and is simply a fully electrified net fence that is easily taken up and down for stock management. The multi-strand cable is a 16-gauge material that has greater conductivity and useful life than the plastic based materials. Morrow, R. 2005. Paddock design, fencing, and water systems for controlled grazing [Online]. Publication No. IP152/50. National Sustainable Agriculture Information Service. Available at: http://attra.ncat.org/attra-pub/paddock.html (19 March 2010). Kersbergen, R. 2008. Northeast grazing guide [Online]. Northeast Pasture Consortium. Available at: http://www.umaine.edu/grazingguide/ (19 March 2010).